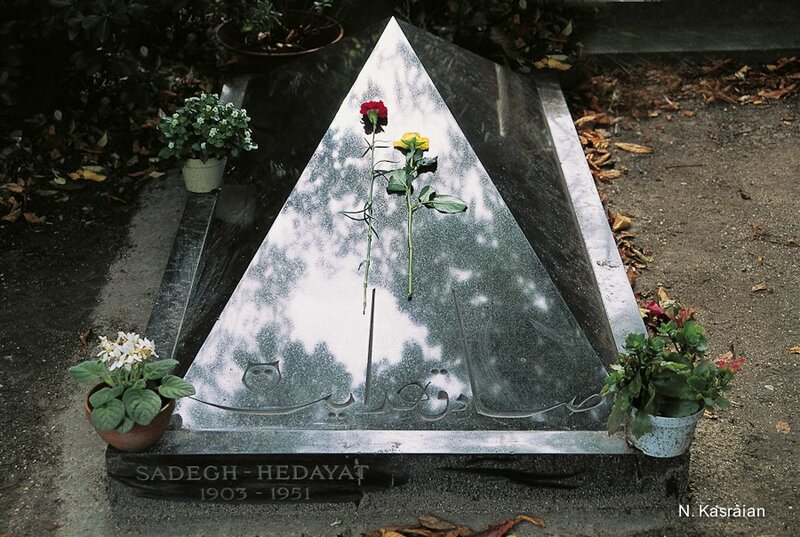 I think the second time I went to Père Lachaise Cemetery, it was for the anniversary of Hedayat’s death. Some people had gathered there. I remember Gholam Hussein Saedi spoke too, and I still hold both his tone in my ears and words from what he said in my memory . . . Interesting that the next time I went to Père Lachaise, it was for the funeral of Saedi himself, and I was only in Paris by chance. I didn’t see him for a long time; for ages I didn’t even know where he was . . . He had disappeared. I asked around and finally found him on Facebook. A few months ago we met for the first time after some ten or fifteen years. I saw him in Rotterdam. He had just come back from Thailand. I believe he had gone there for research, and maybe some massages in between. After all, people are more in need of such things when they grow old . . .
How much he loves this country. Even after so many years abroad, his heart is still here. And while I encourage him to come back, I know that nobody really can give him any kind of guarantee . . . Some forty years later, Italy, Venice. Just a random picture! The exact date of the photo, 1994, is when I had an exhibition in Florence and from there headed to Venice . . . No one was bothering her, and she was bothering no one. She sunbathed. I took my picture. To each their own. Our houses were similar; the fruits of one contractor’s labor, built simultaneously; with white bricks produced in Qom; the ceilings made with crisscrossed iron beams, which were not that popular back then; two floors, on each floor two connected rooms that could be separated by curtains; mantels with stuccos of the protruding torso of an angel with little wings and large breasts on either side of the fireplaces; and sparse stucco decorations on the ceiling where the two rooms were divided. Along the hallway on the second floor was a small room that had been given to me, a room of around two by two meters (in the house that shared a wall with ours, the same room belonged to the neighbor’s daughter). The room naturally should have been offered to my brother, who was twenty days older than me, but since my father’s second wife (my mother) lived on the second floor, it ended up becoming mine; perhaps there had been arguments and physical quarrels over the room being given to me, of which I fortunately remember nothing. In our house, such fights, between my brother and me, often occurred, for one reason or another. He was both taller and stronger; I was shorter and more studious! My room was not one of those rooms that would prompt Balzac to fill up ten or fifteen pages to describe its furniture: one zilu carpet, a nonstandard mattress the same size as me, a comforter, a pillow, paper and pen, and some books—chic solitary confinement! We would let the younger ones off after they had run around the pool forty times and done a few workout moves; then it was time for the older ones to do heavier exercises; the “older” brother and me, and sometimes the two younger ones. Boxing and weightlifting. I won’t say much about our boxing. The ring: a corner of the yard; our gloves: made of old discarded jeans that were stuffed with sheep’s wool; the lingo of our workout: phrases like “left hook” and “right hook” and “upper cut” (I have no idea where we had picked these phrases) . . . the results: bruised eyes and swollen lips . . . the intentions: to be prepared for possible enemies and sometimes to get even with one another on account of unexpressed grudges! In our workout, as the elders, weightlifting had a special status; it had its own story! (Our equipment though not really standard was truly eye catching: two large cement cylinders through the holes of which went the handle of a shovel from Tuyserkan—last year when I traveled to Tuyserkan, I realized after sixty years that the very strong wood of these shovel handles is of a special tree planted in the region, still planted in some parts—and of course it should be pointed out that later, as the weights we used got heavier, the shovel handle was replaced by an iron bar.) In the beginning we did a series of snatches, and clean and jerks, and the rest of the workout consisted of moving the barbell up and down while we lay on our backs on a bench (placed in a very specific location). This move was my favorite as well as my older brother’s. I knew my own reasons for liking this action but had no idea about his. We would continue with this move until we had no life left in us; it was as if an unspoken competition took place between my brother and me: fifteen, sixteen, twenty-three, twenty-four, thirty-five, ive, ive, ive . . . no one would admit defeat! I always looked, out of the corner of my eyes, in a way my brother could not notice, at the window of the two by two room of the neighbor’s house; I sometimes even noticed the movement of the curtains behind the window; there was no doubt it was her; and in my heart, I felt that she, perhaps through my sister, knew that my grades were better than my brother’s; so the only thing that was left to be done was to work out! During the summertime, one day when I was looking at their yard through the curtains of my window, I saw her, wearing a bikini, having finished swimming in the very pool whose dimensions I already mentioned to you, lying down on the stone edges of the pool to sunbathe, like the belles I saw in the movies . . . This wasn’t a movie, it was happening in reality, and more importantly she was not taking her eyes from the window of my room . . . Back then, people could swim in the pools of their house or at beaches of the Caspian Sea, and others could take delight in such scenes with no expenses whatsoever; it was only much later when everyone had to go to such expense and travel at least to Antalya . . . There was no doubt left at all . . . Love, or whatever it was, was mutual. Oh . . . Finally one day, when I could not bear it anymore and felt I had made enough progress in my bodybuilding, I sent her a message, through my sister, saying something along the lines of “You are so beautiful!” . . . Not more than two or three hours later, my mother called to me, “Nasrollah! Is it true that you made a wisecrack to the neighbor’s daughter?” Devastated! I was devastated! And not just of shame! I had always told my mother everything; there were no secrets between us; neither had she expected such a “hideous” act from me, nor had I ever done such a thing. In that moment, I only had one wish: for the ground to open up and devour me. I had no choice but to confess to my sin and express my shame. There was no escaping; there had even been a witness to the crime, my sister! I don’t remember exactly, but it seemed that mother had done her research before confronting me. All this was just part of what was going on inside me; I felt like someone betrayed, and for some reason I could not understand why I felt there was some kind of conspiracy going on, that one or a few people had wanted to mercilessly disgrace me; I had no idea who or why . . . Wedding ceremony, Kohgiluyeh and Boyer-Ahmad, 1976, published in two of my books, Gozar (Transition) and Gozaresh-e Yek Zendegi (Report of a Life). We’ve known each other for forty years or so; we are kind of bosom friends. We have travelled with one another more than you could imagine. He is a wonderful travel companion; I believe we have traveled some 300,000 kilometers together. Many times when we had no other choice but to sleep in the car, Bijan would spread his sleeping bag outside the car and fall asleep, and when he slept, it was as if a rock slept, and it seemed to me that he slept exactly as he slept on the therapeutic mattress in his own house. I too used to do the same thing when I was young and even more mindless than I am now—of course I don’t mean Bijan did this because he is mindless, no, he did it because he believes that if we don’t bother other creatures, they won’t bother us either; after all, he spent his childhood with the nomads and also studied zoology. I respect his perspective, but I prefer to sleep in the car! Anyway . . . But what should I do when I do not have the courage to live! This photograph shocked me. This photograph caused me to lose sleep. It has been a long time since a photograph had such an impact on me. This photograph has shaken me more than all the other apocalyptic photographs from Syria and Iraq. I have not forgotten the photograph of the child’s body on the beach, or the bloody terrified face of the four-year old Syrian kid in the ambulance. But this photograph is frozen in front of my eyes. From the moment I saw this picture, I have wanted to write about it, and from that moment too many thoughts have invaded my mind for me to be able to write about it, until today, after a long night of insomnia. And I kept thinking of brainwashing or the money this person had been paid to make it worth being taken captive under such conditions. This photograph is frozen in front of my eyes. In the photograph, there is no trace of either the war machines one sees in action movies or of weird-looking weapons. Nothing that can be a sign of war is seen in it, not even the tip of the boots of the victors. And still, you can see everything about war in it. 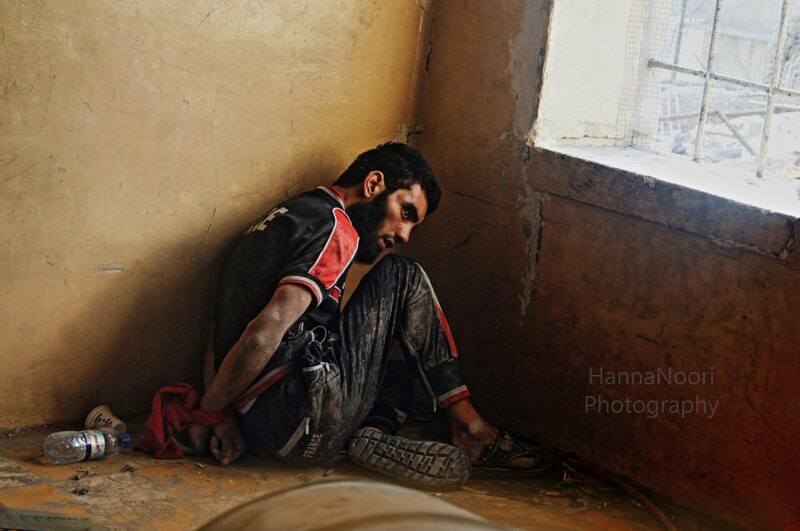 It would only suffice to look at the eyes of the prisoner of war, at the way he sits, the red cloth with which his hands are tied, the empty water bottle, the mud-splattered wall of the room, the floor of the room, the half-visible guarded window, part of a barrel, and once again the terrified look of a man who is as if an animal caught up in a trap, having no idea what awaits him. I didn’t know the photographer, but thanks to the blessings of the virtual world I was able to contact her, and I realized she is a young Iranian Kurd woman who now lives outside of Iran. She explained that they had been given only two minutes to take a photo of the prisoner. She spoke of the photographers flooding the room and their competitiveness . . . And I thought of the prisoner and his past; of what was going on in his mind in those two minutes; of his future; of his family seeing his photograph in that condition; of human beings; of the destiny of human beings; of war’s misery; of crimes; of violence; of ideology; of the dollar; of God; of religion; of Rex Tillerson; of Putin; of Erdoğan; of Abu Bakr al-Baghdadi when he announced the establishment of the Islamic State in Basra, in Noor Mosque . . . of the moment people were lined up and decapitated in front of the eyes of the people of the world; of those who, whenever they reclaimed a territory, would bring the corpses of those left under the ruins, decapitate them, and proudly share their pictures on social media . . . of revenge! Revenge! . . . of the vicious circle of violence, of idiocy, of backwardness, of prejudices, of intolerance, and even of acid throwing . . .
She said no matter how much the photographers asked him to look at the camera, he did not do it. She said she was the last photographer taking a picture of him. She said many of the war photographers there were growing depressed that the war was ending . . .
And I thought of arms factories and all those for whom death is a profession, of those who give the orders, of those who are never tried, of corpse washers. She said and the moment he finally looked at the camera, I could not bring myself to take a picture of him, I didn’t want to.
. . . And I too end this note at this moment. Many years ago, a friend introduced me to one of the most important photographers of Iran by taking me along to his studio. Since then, Nasrollah Kasraian has become one of the most important people in my life, inspiring me not just with his photography and work, but also with his philosophy and way of life. A few years ago we were sitting in his studio and he was showing me some photographs that he felt held stories within them, of himself and of the people portrayed in them. I remember asking him to share those stories, and he demurred, saying that his medium was images, not words. I did not believe him because I had come to learn what a good storyteller he was, but I could also understand his preference for the visual. After all, he has spoken through images for almost half a century, driven some three and a half million kilometers all over Iran in order to take pictures, and changed the history of Iranian photography and ethnography through his work. Nasrollah Kasraian has an aversion to the economics of the art market and has consciously stayed away from auctions, expos, and many art exhibitions. Instead, he turned to publishing photo collections, which he believed would make photography affordable for the public and bring it into their homes, a belief he continues to hold, keeping the prices of his work much lower than what the market dictates. I remember when I was only thirteen, my brother and I wanted to get our mom a gift for her birthday (or maybe it was an anniversary gift to our parents). It was perhaps the very first gift we were going to buy for her (them), and that fact made us feel so grown up and proud of ourselves. We ended up getting them the first edition of Kasraian’s Our Homeland Iran (1990), which had just come out. It was one of his first books and brought him national fame. The book immediately became a bestseller, and has since gone through more than a dozen editions, each with thousands of copies sold (and this is a very high number for the Iranian publishing industry). It is astonishing to me that many years after we had purchased that first edition, I got to work with its photographer on the translation of the text for the latest edition of that very book, Our Homeland Iran (2012). In 2016, Nasrollah Kasraian joined Facebook. Not a small feat for someone who still does not carry a cellphone, who at the time didn’t even know how to type, and only taught himself gradually. He started by sharing funny stories of the process of joining and figuring things out on Facebook, and by sharing a few of his translations of Charles Bukowski’s poems, which he had already compiled in a two-volume set of more than seven hundred pages, but for which he had failed to receive a publication permit from the Iranian Ministry of Culture and Islamic Guidance. For Nasrollah, Facebook became a platform on which to tell stories, of the present and the past, of his travels, of daily life, of events, of people, of anything and everything. With his captivating stories; the photographs from his archive that accompanies the notes; his honest, intimate, and witty voice; and his appreciation for life and for the human connection, he rapidly built a large readership of Iranians from around the world. The following are translations of a few of those notes. Nasrollah Kasraian was born in 1944 in Khorram Abad, in the province of Lorestan in Iran. Known as the father of Iranian ethnographic photography, he was arrested by the Pahlavi regime in early 1971 for his political activism and for the translation of The Bolivian Diary of Ernesto Che Guevara. Whilst in prison, he translated his first book on photography. Upon his release in 1975, he became a professional photographer. 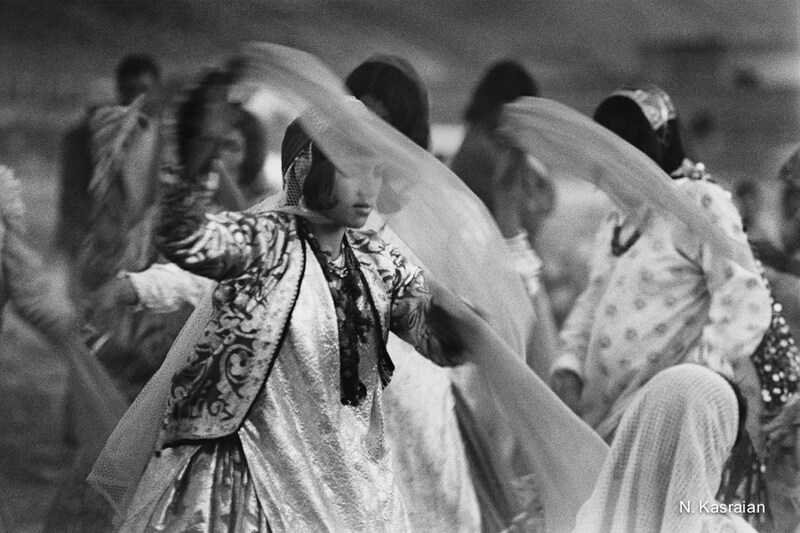 Since then he has published more than thirty-one books of photography, many of them in collaboration with his wife, the ethnographer and educator Ziba Arshi, documenting the lives of different Iranian ethnic groups, nomads, and the diverse natural landscape of the country. Sarzamin-e Maa Iran (Our Homeland Iran), Gozar (Transition), Isfahan, Kurdistan, Tehran, Torkamanha-ye Iran (Iran’s Turkmans), Damavand, Kavirha-ye Iran (Iran’s Deserts), Persepolis, Shomal (The North of Iran), and Jonoob (The South of Iran) are just some of his titles. In 2015, Gozaresh-e Yek Zendegi (Report of a Life), a selection of his photographs, was published in celebration of his lifelong legacy. Poupeh Missaghi is Asymptote’s Iran editor-at-large. She holds a Ph.D. in English-creative writing and an M.A. in translation studies, and currently teaches as a visiting assistant professor at the creative writing program of Pratt Institute, Brooklyn. Her first book, trans(re)lating house one, is forthcoming from Coffee House Press in 2020. Her nonfiction and fiction have appeared in Diagram, Catapult, Entropy, The Brooklyn Rail, The Feminist Wire, World Literature Today, Guernica, The Quarterly Conversation, and elsewhere. Her translations have been published in Quarterly West, The Puritan, National Translation Month, Copper Nickel, Denver Quarterly, and Asymptote.